We don’t brew beer on the premise, but we can can order in beer making supplies for you. Please check out rjscraftwinemaking.com for beer kits we can order in for you. Heritage Estates makes a perfect wine for those who are new to winemaking and enjoy light, easy drinking wine. In 4 weeks, you will have crafted a quality wine. This wine kit produces a wine kit that is drinkable when young. Every kit contains all the ingredients required to craft 23L of wine. 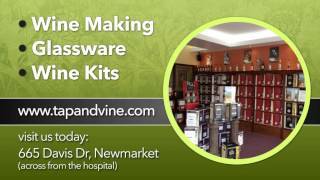 We carry a large selection of giftware in our store. If you are looking for that perfect gift for your wine connoisseur, we can help you.